I always liked rhubarb. It grew abundantly in our garden, and my sister, my two cousins, and I were admonished not to eat it raw – especially not the leaves – in the same way we were told not to bite into the pods of golden chain, monkshood, lily-of-the-valley or foxglove. OR ELSE! My mother usually cooked rhubarb for compote, to eat with vanilla pudding or quark, but sometimes we bought rhubarb streusel cake, or rhubarb meringue torte from the Konditorei. The rhubarb plants in our garden in Bar Harbor were hardly visible when we moved into our house. Suffering from years of living in the shadows, malnourishment and crowded out by weeds, they had shrunk to puny proportions, with spindly stems too anorectic to harvest. 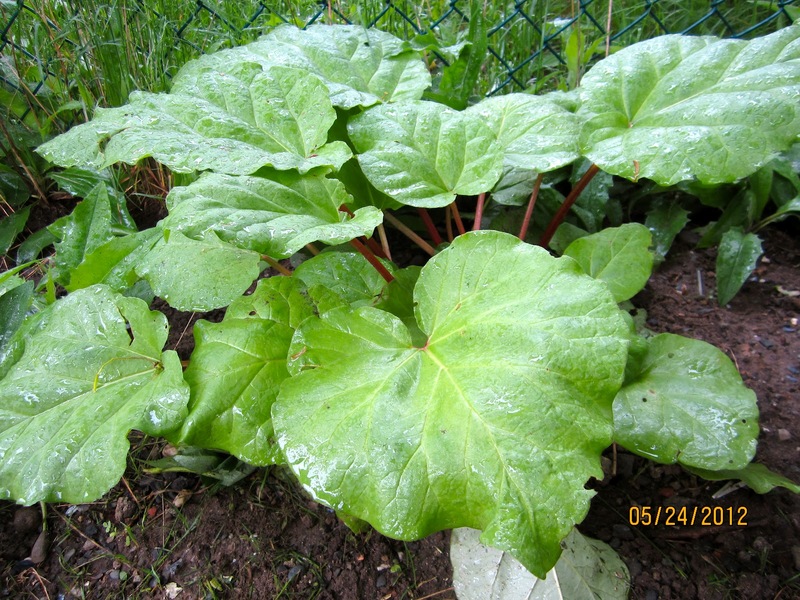 My in-laws planted rhubarb in what was, in those days, a sunny patch along the fence, but long since overshadowed by maples and cedars. I didn’t even think they were worth the effort of digging and planting them somewhere else, but, at least, I freed them from their suffocating neighbors, and graciously fed them some compost. In the meantime, some trees have come down, and more light is now reaching these poor plants. They seem to like my grudging care, and look much more vigorous this year (even growing gamely back after some people – I will not name names – dumped a garbage can right on their patch). Since they are still on the way to recovery, I bought the fat, healthy rhubarb stems for this wonderful cake at Hannaford’s. 1. For the crust: using a wooden spoon, mash butter in a bowl, and mix with powdered sugar. Add egg, and mix until completely blended. 2. In second bowl, sift together flour, starch, baking powder and salt. Add to bowl with wet ingredients. Work dough into ball, and then press into a flat disk on plastic wrap. Wrap and refrigerate dough for 30 minutes. 3. For the rhubarb compote: in sauce pan over medium heat, let sugar caramelize until light brown. Add orange juice (or wine), then rhubarb, and cook for 5 minutes, or until rhubarb is soft and sugar dissolved. In small bowl, dissolve starch in 1 tbsp. cold water (or liqueur). Stir into rhubarb, and let cool. 5. On lightly floured surface, roll out dough to a 11-inch/28 cm round. Place into tart form, pushing dough to sides. Trim excess with knife. Refrigerate for 30 minutes. 6. Preheat oven to 400ºF/200ºC. Adjust rack to second lowest position. 7. Cover dough with paper round, then with pie weights (or dried beans.) Bake for 15 minutes, remove pie weights and paper. Continue baking for another 10 minutes. Let tart crust cool (in pan) on wire rack. 8. For the vanilla cream, scrape vanilla bean. Add empty pod and heavy cream to sauce pan and cook until cream is reduced by 1/5th to 14 oz/400 ml. Remove vanilla pod. 10. Let cool for 5 minutes, then stir in mascarpone. Leave to cool, until cream begins to set. 11. Spoon rhubarb compote evenly over baked crust. Chill for 30 minutes. Spread vanilla cream evenly over rhubarb. Refrigerate tart for several hours, until cream has set. 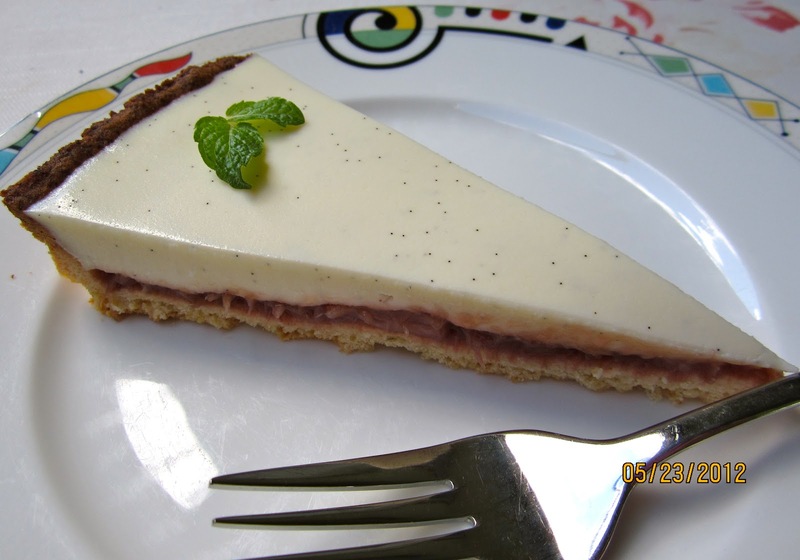 I adapted this recipe from essen-und-trinken.de: “Rhabarber-Vanillecreme-Tarte“. Previous Post MY PANTRY – FLOUR TYPE "TRANSLATION"
Thanks so much for the recipe. My rhubarb plants are doing very well and are begging me to bake something with them!! Maybe this long weekend is my cue to do so. The tart crust sounds wonderful too. Since I don't have mascarpone, I'll probably just sub cream cheese. One of my favorite rhubarb recipes is Rhubarb Custard Bars. You make a butter crust (and pre-bake it), mix eggs/milk/rhubarb/sugar and pour it over the crust. Bake. Top with sweetened cream cheese + whipped cream topping. Yum! I'm sure you can substitute mascarpone for cream cheese. My cousin from Germany just sent me a recipe for “Rhabarber-Eierschecke”. I had never heard of that kind of cake, but it is a also a custard bar made with three layers, rhubarb, quark creme and vanilla pudding. Just ignore the low fat and fat free stuff, and replace with regular fat stuff. It looks like they updated the recipe in 2008. My printed copy (2005 maybr?) says to use margarine but of course butter is preferable and better. Instead of coolwhip you can use whiiped cream. Your cousin's recipe sounds yummy too. Will you be making it soon? Thanks for the link, Hanaâ. Margarine and coolwhip – that sounds like something from the fifties. Yes, I want to try my cousin's favorite recipe,too. First we have to finish the Strawberry Rhubarb Pie from “Rhubarb Renaissance”, though.